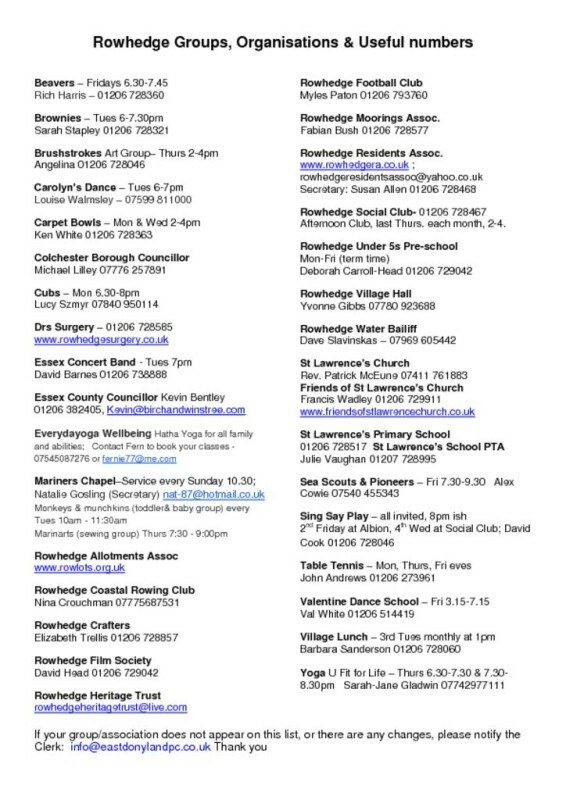 Rowhedge has a wide range of clubs, groups and organisations for you to get involved with. There are noticeboards on Lion Quay and on the entrance road to the Village Hall, where clubs can post details of their upcoming events and activities, so do check these to see what’s happening. Groups are also welcome to email us copies of posters for us to circulate on our weekly mail out to residents – we send this out on a Friday, so please send your posters and event details to info@eastdonylandpc.co.uk by Thursday for inclusion in that week’s mail out. We will also add your events and activities to our events page – please click here to see what’s happening. Please note, if you are planning to hold an event on Rowhedge greensward areas, the quaysides or the recreation ground you will need to complete an event application form and submit it to EDPC at least 6 weeks in advance of the event.